THE PUERTO RICO ENERGY CENTER (PREC) IS DEDICATED TO ADVANCING PUERTO RICO’S ENERGY EFFICIENCY AND CLEAN ENERGY USE THROUGH RESEARCH, TECHNOLOGY TRANSFER, EDUCATION AND DEMONSTRATION. To contribute to the creation of knowledge in alternative and renewable energy, as well as in energy efficiency practices and technologies. • To promote the use of alternative resources to contribute to the conservation of the environment and the sustainable development of Puerto Rico, as well as other tropical and insular regions. The Executive Director is responsible for the operation of the Center. 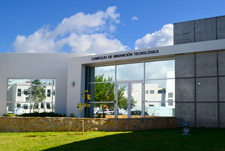 Four departments carry out its activities: Scientific Research, Education, Product Development and Technical Services. An Industry Advisory Board, made up of industry and government representatives, advises the Center on its strategic development. A Technical Committee, composed of scientists and engineers from industry and academia, provide higher level technical assistance. The Center maintains strategic alliances with leading national energy centers in the U.S and Europe. These relationships contribute to the adoption of good practices as well as technology transfer activities and other collaborations.